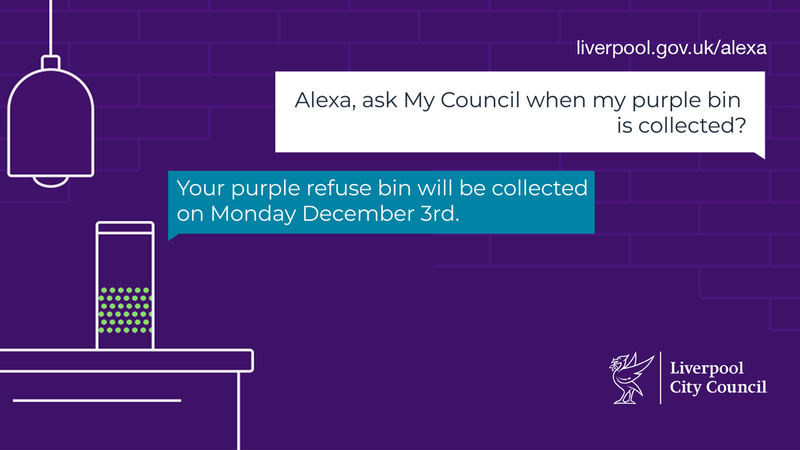 You can now ask your Alexa device for information about services provided by Liverpool City Council. This is just the start, and we'll be adding more services soon. You can access this skill on all your Alexa devices - just log into your Amazon account, search for 'Liverpool City Council' and then enable this skill. Please note - You will need to make sure you have your address setup within your Alexa device to obtain local information. You will need your full residential address setup on your device, for example "1 High Street" as the Street Address, "Liverpool" as the Town/City and "L1 1AA" as the Zip Code/Postcode. For help setting up your address on your Alexa device, please visit the Amazon help page.